Thought you'd heard it all? Read about the new National Harbor opening this side of the Potomac in Prince George's County, a short drive from downtown DC. - ART, retail, dining, glitz! Washington Glass School and Art Whino are a few galleries that will be opening spaces there. Artworks that are installed in National Harbor include sculptures by Albert Paley, who made "Portal Gates" for the Renwick Gallery in 1974 and J. Seward Johnson Jr.'s giant, the Awakening which was moved from Hain's Point to the promenade at National Harbor. "National Harbor's scale is that of a city's. Its cost is in the billions. Already, you can't miss it. It's as if a small Dubai had suddenly appeared in sight of the Capitol dome." "At National Harbor art wasn't an afterthought. We had art before we had buildings." "The mainstay of this whole project is art." says Milt Peterson. In National Harbor Hotel, Pr. George's Gets Long-Sought Upscale Development. 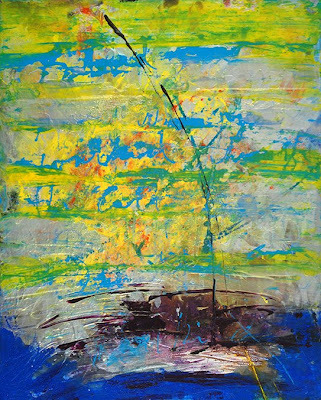 Doris Colbert Kennedy's recent abstract paintings dichotomously place her in both the aggressive school of American Abstract Expressionism and in the self-reflective Color School of Washington, DC painters. Her dynamic and cosmic like compositions embody the vigorous push and pull of the one while exuding the mental serenity and self-reflection of the other. Presented by Anacostia Fine Art. THE MIGRANT PROJECT addresses the phenomenon of Mexican migrant workers in California through a series of photographs by Rick Nahmias. This exhibit, which is now the subject of a new book just published by University of New Mexico Press, offers a rare contemporary look into the lives of one of America's largest invisible and disenfranchised populations. The pictures were taken in fifty different towns across California; they address the day-to-day life of migrant workers and their families, giving a human face to this otherwise forgotten population. The Migrant Project, an indepth photo-documentary (with bilingual text), proudly places the faces and stories of those currently working our fields front and center, providing a present day microcosm for numerous issues surrounding the human cost of feeding America. "Ornament as Art: Avant-Garde Jewelry from the Helen Williams Drutt Collection,"
The exhibition traces the development of artist-made jewelry and honors its craft roots while also placing the work within a larger framework of seminal movements in 20th century art. Ornament as Art showcases a broad array of national and international works made between 1963 and 2006. The exhibition includes 300 objects, including 275 pieces of jewelry and drawings, watercolors, sketchbooks and sculptural constructions by the artists. Cindi Strauss, curator of modern and contemporary decorative arts and design at the Museum of Fine Arts, Houston, organized the exhibition; Robyn Kennedy, chief of the Renwick Gallery, is coordinating curator for the exhibition in Washington. The Renwick has also organized a symposium, "A Grand Passion: Global Perspectives on Contemporary Art Jewelry," Apr. 12, 2008, with presentations by Drutt as well as artists Robert Baines, Claus Bury, Robin Kranitzky and Kim Overstreet. The Arts Club of Washington is currently holding its Annual Call for Entries. This coming year’s curator is Erich Keel, Head of Education at the Kreeger Museum in Washington, DC. Artists selected will be offered a solo exhibition of their work in one of Arts Club three galleries. The exhibitions last one month and are well attended. All styles and medium of work will be considered. Article in Washington Post, The Secret to Starting a Great Art Collection? It's Not a Fat Bank Account. 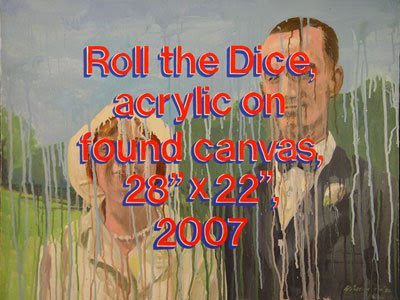 curated by Jefferson Pinder, Karen Joan Topping and B Stanley Painting over the anonymous with the obvious is the dialogue Jerome Spinner is entering into with anyone that looks at his work. To answer your question before you ask it; to exert a kind of meaningful control over what you should consider is important. Stenciling the title, media, size and year in block letters onto art works he gets at flea markets, yard sales and thrift shops the label becomes the work. It seems a blatant and simple critique of the relationship most viewers have with a work of art or artifact –the six seconds it takes to read the label. Except it’s not that simple. Calling all artists: Time to wash off those paintbrushes and tune up your guitars. Registration will open online Thursday, March 27, at noon for artists who want to participate in Artomatic 2008. The annual art extravaganza, to be held May 9 through June 15, 2008, will be the largest Artomatic to date. Hosted by the NoMa (north of Massachusetts Avenue) Business Improvement District (BID), Artomatic 2008 will be held on nine floors (more than 200,000 square feet) of the Capitol Plaza I building. The building is located at 1200 First Street, N.E., just one block west of the New York Avenue Metro station, in Washington, D.C. Into the Light is a juried exhibition with a selection of artwork that focuses one or all of the following topis, LIGHT, INNOVATION or OPTIMISM. 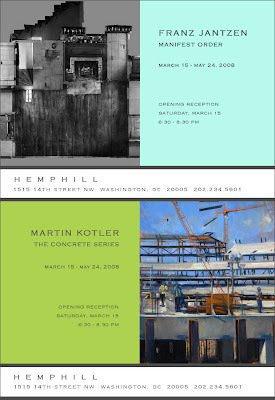 Opening Reception: Saturday March 29th, 2008 at 7pm. Selected exhibitors are as follows: Mark Planisek, Marie Cobb, Lynn Silverman, Craig Kraft, Emily Erb, Phil Stein, Joan Belmar, Cathlyn Newell and Kendall Nordin. Expect to see all types of media from video installation to photography. International Arts Artists is committed to bringing together like-minded people in order to revitalize and strengthen the local arts scene. They are offering a new Membership program to listen and respond to the needs of DC-area artists. Membership and patronage from DC-area artists and designated support from local patrons goes exclusively towards IA's local programs and exhibition activities. This project is the pilot for IA's national and international artist service program that will be based (and will remain) here in Washington. Join Warehouse and Molly for a closing supper on Sunday the 6th between 4 and 6pm. Bring a companion and meet the other Peace artists for conversation, food and fun. Artists may pick up work after 4pm, April 6, or on Monday April 7 from 8am - 3pm - go upstairs at 1017 or Monday 5-7pm. After that email Molly Ruppert for convenient time. Warehouse is located at 1017-1021 7th Street NW, between New York Ave. and L St. in downtown Washington, DC, across the street from the new Washington Convention Center. » MT. VERNON SQ. (Green/Yellow Lines): 1 Block / walk south on 7th St.
» GALLERY PLACE / Chinatown Exit (Red/Green/Yellow Lines): 4 Blocks / walk north on 7th St. The artists featured in this month’s exhibit of works were selected by Stephen Bennett Phillips of the Phillips Collection for the New American Paintings publication, Volume No. 69. While time has passed since they were recognized for their work nationally, we at the Long View Gallery were drawn to the strength of their talents. Jamie Pocklington’s subjects come mostly from internet photos albums and image search engines. He is drawn to images that have universal qualities that he then collages into new scenarios, out of context of the original photos. Jair Lynch, president and CEO of the Jair Lynch Company, presents his firm’s experience applying smart growth techniques to revitalize urban neighborhoods in Washington, DC. No charge; registration not required. I took these pictures one recent sunset in Washington, DC. The gray tonality adds a moody quality to the images. I like the relationship of smoky greys, flight and brooding clouds. Photos by Anne Marchand, Copyright 2008. All Rights Reserved. Thursday, April 3 at 6:30pm, cocktails, jazz music, and remarkable artwork. Meridian will hold two panel discussions on April 11, 2008 bringing together scholars, public diplomacy officials, and jazz enthusiasts, to share their knowledge of the State Department tours and examine the implications of these efforts as they relate to our current needs. To RSVP for the April 3 reception, call (202) 483-0429. To RSVP for the April 11 panel discussions, reception, and concert with Dave Brubeck, call (202) 993-5543. Meridian presents a photographic exhibition that chronicles the international tours of legendary jazz musicians selected by the U.S. State Department to serve as roving cultural "ambassadors" from the 1950's through the 1970's. Over 100 compelling images, together with posters and other materials, portray the journeys of music greats such as Dizzy Gillespie, Benny Goodman, Dave Brubeck, Louis Armstrong, Duke Ellington, Benny Carter, and Sarah Vaughan. "New York is not about razzledazzle," Andrea Pollan, the director of Curator's Office, a Washington, D.C., gallery that is showing at Scope New York, said. "I'd like to think there's a little more contemplation going on in New York, a more thoughtful process to collecting." Irvine Contemporary is pleased to present the first US solo exhibition by Montreal-based artist Heidi Taillefer. Taillefer's oil paintings on canvas and panel are an original creative fusion of realism and surrealism combined with popular traditions ranging from illustration and manga to Victorian romanticism. Her striking imagery combines painterly surrealism with the latest cyborg fantasies--Max Ernst meets The Matrix. Preview images. Heidi Taillefer began drawing at the age of 3, and after a decade of private art lessons, she began pursuing careers in both fine art and illustration. After studying at McGill University, Taillefer dove into the deep wells of Surrealism and Symbolist painting, illustration and comic styles, and all the variations of cyborg imagery. She developed a style in oils and acrylics known for a fusion of mechanical and organic imagery and the appropriation of symbolic styles. Her work has appeared in numerous publications, and she also designs book, album, and magazine covers. She has exhibited her paintings through venues across North America, including the McAllen International Museum of Art and Science in McAllen, Texas, and she is well-known for having designed the internationally recognized image of "Dralion" for the Cirque du Soleil. NEW YORK - Building on Miami’s overwhelming success, SCOPE launches its 2008 season with its flagship fair, SCOPE New York 08. SNY08, an invitation only edition of SCOPE art fairs, proudly returns to Manhattan’s most famous cultural icon, Lincoln Center, with a glass facade pavilion situated in Lincoln Center's Damrosch Park, at the corner of 62nd Street and 10th Avenue. SCOPE New York is just blocks from the Armory Show and serviced daily by VIP Zip cars, shuttles and pedicabs. Featuring galleries from four continents and 20 countries, including China, Mexico, Japan, Korea, Brazil, Italy, France, Belgium, the Netherlands, Norway, Switzerland, Germany, UK, Spain, and Canada, SCOPE New York 2008’s 50 invitees will uphold its unique tradition of solo and thematic group shows presented alongside museum-quality programming, collector tours, screenings, and special events.The fair opens to Press,SCOPE and Armory VIPs on Wednesday, March 26, 3-9pm with the FirstView benefit, a $100 charitable donation for all non-VIP cardholders. Introducing artists, curators, and cutting-edge galleries to new audiences internationally has made SCOPE the most comprehensive destination for the emerging art world available anywhere. With art fairs in Miami, Basel, New York, London, and the Hamptons, SCOPE is proud to be an influential presence in the expanding global art market. located at the intersection of 9th Street and U street NW). Metro Access: Project 4 is easily accessible by metro. We are located one block east of the green line U St/African-American Civil War Memorial/Cardozo metro station, 10th Street exit. “Catherine Bohrman’s compact abstractions in alabaster, bronze and marble possess soft edges that belie the magnitude of their density,” said Allen Hoffman, Legislative Liaison and Senior Program Associate for the Connecticut Commission on the Arts about her work. Gene Markowski's, "Revelation" at District Fine Arts uses the Roman Catholic Church as the springboard into his personal (he is a practicing Roman Catholic) revelations about the church and its rigid stance on such topics as abortion, gay rights, priestly sexual abuse and entitlement, the exclusion of women, and saintly myths. He approaches his subject with a sense of humor without losing the importance of the issues, or that the images are primarily works of art. Without question, his poetic side manages to shine through the issues he touches on, which keep the series engaging. However, the key to fully appreciate the exhibition are the titles of the photographs which are often with a double amusing meaning. Still/life, the human figure, and self-portraits form an enigmatic series of images that consistently underscore such psychological states as eroticism, ecstasy, revenge, and rejection. The images are intentionally without photographic refinement, but carry a deeply expressive and vital energy that conjures Markowski's personal journey into a visual representation of some of the troubling aspects of the contemporary church today. The human condition which is so deeply wound around these photographs can be read entirely separate from the Catholic question, revealing our own inner lives, shaped by the complicated world we live in. The moral and intellectual questions Markowski poses are the core of the exhibition, and he gives the entire show the lift it needs through his sensibility and salient humor. Markowski is a Professor of Art at Trinity University where he has taught studio courses for the past twenty years. He is an active artist with many one man and group exhibitions in his extensive career. His work is represented in many private, corporate, and museum collections throughout the United States and Europe. Arena Stage continues its celebration of acclaimed American playwright Arthur Miller with A View From The Bridge. Miller’s story of a dockworker struggling with incestuous feelings for his niece covers all the usual bases of jealousy, distrust, and betrayal, but it also tackles tougher topics, such as illegal immigration and citizenship.To catch on to even more of the play’s political undertones, be sure to read up on Miller’s feud with former collaborator Elia Kazan before you go; the play harshly criticizes Kazan’s cooperation with the McCarthy-era investigators who went on to blacklist much of Hollywood for their Communist sympathies. Up to 800 artists and 50,000 visitors expected in D.C.’s most exciting new neighborhood. The NoMa (north of Massachusetts Avenue) Business Improvement District (BID) will host this year’s Artomatic, the Washington, D.C. area’s homegrown art extravaganza. From May 9 through June 15, 2008, up to 800 local and regional artists will exhibit their works on eight floors of the Capitol Plaza 1 building, located at 1st and M Streets, N.E., just one block from the New York Avenue Metro station. Held regularly since 1999, Artomatic transforms an unfinished indoor space into an exciting and incredibly diverse arts event that is free and open to the public. In addition to displays and sales by hundreds of artists, the event features free musical, dance, and theater performances; holiday celebrations; films; educational presentations; and much more. This year’s Artomatic, occupying 200,000 square feet at Capitol Plaza 1, will be the largest to date. Designed by renowned architect Shalom Baranes and owned by an affiliate of The Polinger Company, Capitol Plaza 1 offers 293,000 rentable square feet of Class A office space, with dramatic Capitol and city views from the upper floors. Registration for artists and performers who wish to participate in Artomatic will be open soon. To stay up to date on the event details and schedule, visit www.artomatic.org and sign up to receive the Artomatic newsletter. NoMa is an emerging mixed-use neighborhood north of the U.S. Capitol and Union Station in Washington, D.C. Private developers have invested almost $2 billion in 2007–2008 alone, with plans to develop more than 20 million square feet of office, residential, hotel, and retail space in the 35-block area covered by the NoMa BID over the next 10 years. For more information about the BID, including an interactive development map, see the BID Web site at www.nomabid.org. Artomatic is a creative community that collaborates to produce and present a free arts spectacular. Participation is open to all, from recognized artists to undiscovered talents, who work in a variety of arts forms. In partnership with the development community, Artomatic transforms unused building space into a playground for expression, serves as a catalyst for community growth in up-and-coming neighborhoods, and helps to grow our creative economy. The nonprofit Artomatic organization is headed by a volunteer Board of Directors and is funded in part by the D.C. Commission on the Arts and Humanities, an agency supported by the National Endowment for the Arts. For more information, visit www.artomatic.org. The first day of spring this year (2008) is March 20. The equinox will be at 5:48 GMT. Welcome Washington, DC’s cherry blossom season at a festival celebrating Japanese arts and design and at the official opening ceremony of the 2008 National Cherry Blossom Festival®. No charge. Drop-in program. All ages. The Baltimore Mural Program, under the auspices of Mayor Sheila Dixon, the Baltimore Office of Promotion & The Arts, Inc. (BOPA), and the Office of Transportation of Baltimore City, wishes to announce a competition for the commissioning of a new mural on the underpass walls of the 4100 block of Eastern Avenue. Walls are on both sides of the street. The north side represents 700 running feet of wall varying in height between 5’ and 18’. The south side represents four separate walls varying in width between 22’ and 112’ all approximately 10’ in height. Three artists will be selected as finalists. Each finalist will receive a $1,500 stipend for the production of a detailed design proposal. The selected finalist will receive the $45,000 commission, minus the design proposal stipend, for the painting of the mural. Rolling scaffolding and paint will be provided by the Baltimore Mural Program. All artists 18 years of age or older are eligible. Employees of the Baltimore Office of Promotion & The Arts and the Office of Transportation of Baltimore City and their families are not eligible. The mural commission will be awarded by a selection panel nominated by the community organizations representing the location of the mural site. Selection of artists for the commission will occur in a two-phase process. The impact of far-flung communities on one another is the focus of Robbins and Becher, who call it "the transportation of place." Influences and dislocations that intrigue them include German architecture in Africa, Germans dressing as Native Americans, Bavarian-style towns in the United States, and American-style buildings in Cuba. Robbins and Becher investigate these cross-cultural interactions through photography, film, video, and digital media. Shop (or even just hang out!) for a good cause! On March 20th from 6:00-9:00PM, U Street businesses Caramel, Habitat, Moojoo Ken, Nana, Nevin Kelly Gallery, RCKNDY and Wild Women Wear Red are coming together to raise money and awareness for Miriam's Kitchen. enjoy great stuff and some sweet sales. some tasty Miriam's treats. There will also be cookies at each store! you know who loves U Street, who loves to shop, who loves to help make a difference, who loves a random Thursday night outing, or who loves fabulous company. Crystal Flight lands in Crystal City with 50 airplane statues on the streets of Crystal City celebrating flight. New development, high-profile tenants, a revitalized Crystal Drive, award-winning restaurants, energy-filled events, and an epic theater all speak to Crystal City’s evolving character. Couple these exciting changes with one of Crystal City’s most unique assets – proximity to Ronald Reagan Washington National Airport – and the area truly is taking off! 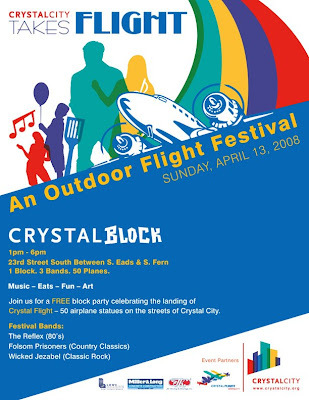 To highlight this aviation connection, the Crystal City Business Improvement District(BID) announces a six-month “Celebration of Flight.” This campaign kicks off with Crystal Flight, which brings 50 (fifty) 5-foot-by-5-foot airplane statues (25 fighter jets and 25 vintage planes) to the streets of Crystal City in April 2008. Each Crystal Flight plane is sponsored by an area business, designed and decorated by local artists, and then placed throughout Crystal City. Aimed to attract visitors from all over, this series showcases Crystal City’s integral relationship with the concept of “Flight,” as illustrated by the proximity to Washington National Airport and the local presence of the United States Air Force, Boeing, Lockheed Martin, Northrop Grumman, and more. “Few neighborhoods have the luxury of a walkable airport connection,” said Angela Fox, President/CEO of the BID. “It’s one of the things that makes Crystal City unique, and we decided to have some fun with it. This will be great for families and aviation enthusiasts everywhere.” Lowe Enterprises Real Estate Group has generously provided workshop space to store and decorate the planes, and JK Moving and Storage, Inc., has partnered to provide critical technical support for the handling of the planes. The BID continues to celebrate other exciting flight-related activities in Crystal City, such as the recent opening of the Boeing retail store and the expanded partnership with the U.S. Air Force and Arlington Sports in hosting the 2nd annual Crystal Ride – U.S. Air Force Cycling Classic on May 4, 2008. Established in April of 2006, the Crystal City Business Improvement District (BID) is creating a soul for Crystal City. A public-private partnership, the BID is providing a higher level of service to visitors, workers and residents in Crystal City – driving to become world-class destination in both Arlington and the greater DC region. Adamson Gallery is pleased to announce an exhibition of prints by Scott Schuman, who is better known by the moniker The Sartorialist, the name of his astoundingly popular street fashion blog. Schuman is one of TIME magazine's 100 most important design influencers, and contributor to style.com (the official website of VOGUE magazine), GQ, Italian VOGUE, and other fashion periodicals. The images in this exhibition were originally taken by Schuman for his blog, but are now reproduced as digital prints. Displayed in a gallery setting, contextually reconfigured from fashion documentary into fine art, Schuman's striking images are evocative of the street photography of Diane Arbus or Lisette Model. In this show Steinhilber uses photographs, sculpture and drawing to explore themes of fluidity, death, violence and desire for control. The subjects of the show are both complex and simple. In the works, foam packing peanuts, plastic bags, and fluorescent bulbs begin to share a narrative that mixes the unnatural with the organic. Help spread the word about these meetings. It would be great to have artists or those supporting artists to come to these meeting to advocate for artist live/work space at the schools that will be closing. Ned Rifkin, the Under Secretary for Art at the Smithsonian Institution, announced today he will resign his position, effective April 11. The Acting Secretary has announced that he will not replace Rifkin. Instead, the art museums and organizations that Rifkin oversaw will now report to the Smithsonian's Acting Under Secretary for History and Culture Richard Kurin. Civilian Art Projects announces the exhibition, craigslist, in its front gallery from March 21 – April 26, 2008 and 100 ways to kneel and kiss the ground, new photography by Kate MacDonnell in the project space. craigslist explores how four artists utilize this renowned community website as a conceptual component in their artistic practice. The exhibition features works by the artist team Joseph Dumbacher & John Dumbacher, Jason Horowitz, and Jason Zimmerman and is co-curated by Jayme McLellan, Director of Civilian Art Projects and Andrea Pollan, Director of Curator’s Office. An essay by Andrea Pollan will accompany the exhibition. Rosetta DeBerardinis has a nice write up of the Color as Field: American Painting 1950-1975 Exhibition on view at the Smithsonian American Art Museum at Daily Campello News. Individuality and vitality of approach are the hallmarks of Group 93 – 2008. The Art Auction Gala was a huge success! If you missed the WPA gala and didn't get to bid on your favorite piece of art, check back at the WPA website. Artwork is open for bidding for the rest of this week. Eligibility: All Mid-Atlantic artists (DC,VA,MD,DE,PA,NJ,WV) artists are invited to submit up to four digital images (jpegs) of 2 or 3 dimensional, installation or video works completed within the last two years and not previously exhibited at MPA. Works that employ multiple images or repetition as concept and/or technique will be considered. Works that move beyond traditional forms and media are encouraged. Works must fit through 81" x 65" doorway. Awards: Cash prizes totaling $1500 will be awarded by the juror. Decisions are final. Entry Fee $25. Fee waived for current MPA members. Fee includes one-year artist membership to MPA. 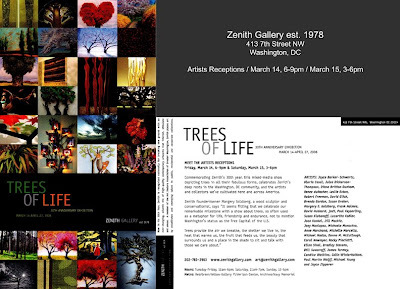 Opening Celebration on Friday, March 14, from 6-9pm and Saturday, March 15 from 3-6pm. Tuesday, March 11, 2008 – 6:30 p.m.
“Two Faces of Mexican Music: Carlos Chávez and Silvestre Revueltas Revisited” is co-sponsored by the Library of Congress Music Division, Hispanic Division, and Rare Book and Special Collections Division; Mexican Cultural Institute, Washington, DC; Mexico’s National Council for Culture and the Arts (CONACULTA); and the Department of Film Programs, National Gallery of Art. Smoke on paper | 55" × 42"
One of my favorite pieces in the exhibition, Rob Tarbell's, gorgeous Aerial Rider, 2007 fetched well over the reserve price. According to Aaron Gallery's Sabrina Reilly, it received the highest bid of the night. If you missed buying Rob Tarbell's work at the WPA auction, go to Aaron Gallery where you can buy another of his works. Rob Tarbell's work is currently on view at Aaron Gallery until April 2, 2008. From the point of view of attendance, the WPA Auction was a hit! And from the bidding wars, most likely a big financial success. If you haven't taken a look at the art, you can see it at the WPA's site. A part of the exhibition remains on view at the Katzen until March 23. The Katzen installed the WPA's Auction Art along a glassed corridor and in two rooms of the museum. A stream of people made their way past each other during the auction to check on the bids for "their" work. It was an exciting night with last minute bids before the whistles closed different areas of the auction. You had to be fast on your feet. The gala dinner ran late and the first area closed within 15 minutes of the stream of bidders. All in all, it was an exciting evening filled with patrons, artists, curators, gallerists and others. 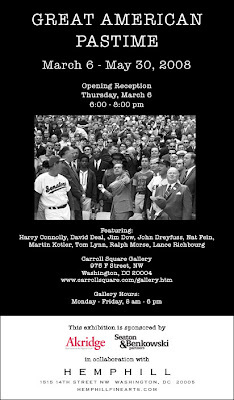 Enjoy work by local contemporary artists and members of the Washington Project for the Arts, a non-profit organization that promotes and supports artists of the DC area. Curated by Kathryn Wat, curator of modern and contemporary art at the National Museum of Women in the Arts, DC. All artwork will be auctioned at the WPA Annual Art Auction Gala on Friday, March 7, 2008. When the Target Gallery asked me to curate "The Five Senses," I must admit that I was a little concerned about the sort of work that I would eventually review for selection. The harsh brainwashing of the post-modernist mafia is a hard thing to avoid, even if you are a rebel against it. I was floored by the sheer diversity of interpretations of the theme, including a lot of three dimensional entries, which are usually represented by a small number, in a juried call for artists such as this one. Not this call! There was a surprising number of 3D pieces in this call and a significant number in the selected pieces. The DC government spent nearly $800,000 removing graffiti in 2007, but this year there's $100,000 in the city budget to HELP graffiti artists produce murals - legally. Interviews with DC Muralist, G. Byron Peck and Graffiti artists including J. Coleman, Jason Philip, Cory Stowers of Words, Beats, Life. Collector's View is a new program created by Transformer providing the rare opportunity for participants to comprehensively view some of Washington's best private collections of contemporary visual art. Each "view" promises to be as unique as the collectors and collections themselves - featuring personal anecdotes on how certain works were acquired, conversations between the collectors and artists in their collections, as well as collection overviews by outside curators and critics. Light fare and cocktails will be served at each event. Participation in the Collector's View series is $75 dollars per person for each "view". As a benefit of becoming a "Visionary Friend of Transformer" at the "Advocate" level for $250 per person, supporters can attend all four events in the series. Contact the Gallery at: info@transformergallery.org or call 202-483-1102. Glass 3, an international studio glass exhibit featuring extraordinary glass artists from Toledo, OH (Home of the US Studio Glass Movement), Washington, DC and Sunderland, UK (Washington, DC Sister City) will open to the public on Thursday, February 21, 2008 at the Shops at Georgetown Mall (3222 M Street, NW). The exhibit runs through March 9, 2008. The exhibit will feature vibrant glasswork, glass blown sculptures, as well as narrative glasswork through etching, writing, and video projection. Admission to Glass 3 is free. Gallery hours are Monday through Saturday, 12 pm to 8 pm, and Sunday, 12 pm to 6 pm. "the WPA's much-anticipated gala on Friday, March 7, at the Katzen Arts Center is set to be one of the city's swankest affairs. Heralded as the most cutting-edge art auction in town, the event features a curatorial cadre hailing from Manhattan to Richmond. Of those picking the pieces, Marc and Sara Schiller of the renowned Wooster Collective will bring their favorite street artists' work and the National Gallery of Art's Sarah Kennel will highlight under-the radar photographers. The auction will not only put new artists in front of the area's leading collectors, it will also raise much-needed funds for the new microgallery space and the organization's operations costs. "Our benefactors are now founding supporters again," says [Kim} Ward. "There's such a new different excitement, and they get to help decide where it's all going to go." The Women's Caucus for the Arts is holding their annual networkng luncheon and membership drive this April. "Art & Your Audience: Maximizing the Artist-Gallery Relationship"
Visit The Women's Caucus for Art of Greater Washington at www.wcadc.org for more details and to download a registration form. A provocative look at the only remaining Frank Lloyd Wright-designed hotel, The Park Inn Hotel in Mason City, Iowa, The Last Wright is a stunning journey through the structure’s 100-year history. This film is presented as part of the DC Environmental Film Festival. Details at http://www.dcenvironmentalfilmfest.org . (Running time: 60 mins) $5 members and students; $10 public. Prepaid registration required. Walk-in registration based on availability. On Monday, April 1st, the DC Advocates for the Arts will be conducting its 7th Annual Arts Advocacy Day. Our community will come together to visit with our DC Council-members to discuss our concerns. The DC Advocates for the Arts want to make sure that we take to the council the true thoughts and concerns of our community. Here is a link to an online survey. I hope that you will take a few moments to take the survey. By participating in this survey you ensure that you will be represented when we go into those rooms on April 1st. If you are interested in being a part of one of the teams (to visit your councilmember) please let us know that by email, and include the Ward in which you live/work. Teams are filling on a first come/first served basis. Celebrating International Women's Day Glass Ceiling: an unofficial barrier to workplace advancement, usually in regard to women or minority groups. Luncheon where Professional women discuss what is happening in corporate, nonprofit and government organizations. Project 4 presents a drawing and sculpture installation by Seattle-based artist Patrick Holderfield. Drawing from diverse associations and sources, Patrick Holderfield endeavors to create work that requires an emotional and intellectual engagement. His goal is to offer some type of authentic experience inciting the viewers contemplation of his or herself in relation to the larger world through the poetic use of both familiar and idiosyncratic imagery. This current body of work centers around a series of drawings portraying environments that suggest pilgrimage, inappropriate expressions of emotions, transformation and conflict. Using the landscape as a grounding element, these scenes of tragedy and eloquence analogize current political, social and personal happenings. The accompanying sculptures and site-specific installations are seen as an extension of the drawings referencing boundaries and nature: specifically, the space, physically and psychologically, that confines and defines an environment. "My vision is of the individual setting off on a journey that is both benevolent and malevolent and where the two are not so clear," says Holderfield. "It is also whats found along the way"
Patrick Holderfield holds a BFA from State University College in Buffalo NY. His work has been featured in solo and group exhibitions across the Pacific Northwest including the Tacoma Art Museum, Frye Art Museum and James Harris Gallery in Seattle. His work is in collections including the Tacoma Art Museum, Altoids Curiously Strong Collection, and the City of Seattle. Take a look at some of the work in Warehouse Gallery's Peace Now! Exhibition Here on **Flickr** and go see the show! The exhibition runs until April 6, 2008. Matt Achhammer, JS Adams, Sondra N. Arkin, Beth Baldwin, Joan Belmar, BLK w/ BEAR, M.P. Brown, F. Lennox Campello, Travis Childers, Michele Colburn, James L. Cypher aka Joey Daytona, Richard L. Dana, Anna U Davis, Tom Drymon, John De Fabbio, Dana Ellyn, Elissa Farrow-Savos, Elizabeth Featherstone Hoff, Dara Friel, John Carlton Hagerhorst, Matt Hollis, Jackie Hoysted, Joseph Jones, Joroko, Mariah Josephy, Jenufa H. Kent, Lauren Kotkin, Heather Levy, Elizabeth Lundberg Morisette, Isabel Manalo, Anne Marchand, Carolina Mayorga, Patricia E. Ortman, Igor Pasternak, Jane Pettit, Mark Planisek, Sajeela Ramsey, Marina Reiter, Ann Ruppert, Nikolas R. Schiller, Julie Seiwell, Matt Sesow, Alexandra Silverthorne, Ira Tattelman, Gabriel Thy, Karen Joan Topping, Ruth Trevarrow, Jessica van Brakle, Mary Walker, Ruth Ward, Ellyn Weiss, Angela White, Andrew Wodzianski, Peter Wood. * Exhibiting artists can send a jpeg of exhibition pieces to post on the Flickr album to blog@annemarchand.com. across the street from the new Washington Convention Center. The DC Commission on the Arts and Humanities (DCCAH) in collaboration with the Executive Office of the Mayor (EOM) and DC Department of Public Works (DPW) seek artists, artist teams and youth organizations to design, create and install aerosol murals or aerosol-inspired murals in identified locations throughout the District of Columbia for a new project entitled Murals DC. Murals DC has been created to replace illegal graffiti with artistic works, to revitalize sites within the community and to teach young people the art of aerosol painting. The goal of this initiative is to positively engage the District's youth by teaching proper art techniques, providing supplies, and a legal means to practice and perform their skill in a way that promotes respect for public and private property and community awareness. 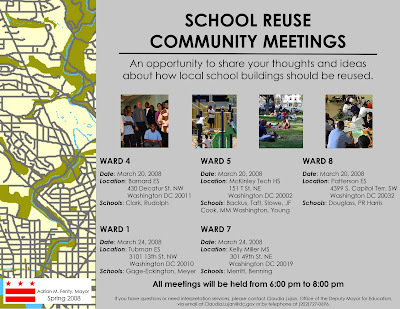 Site selection is based on areas of the District with high incidence of illegal graffiti as identified by the DPW, Mayor's Office of Community Relations and Services (MOCRS) and other agencies. Each mural will reflect the character, culture and history of the neighborhood. For more information, or to request an application in HTML format email Deirdre Ehlen, deirdre.ehlen@dc.gov, or call (202) 724-5613. COOL WATERS, mixed media on canvas, 30"x40,"from the series "The Last Wild Places"
"Amy Barker-Wilson’s spiritual response to landscape reveals itself in colorful abstractions, suggesting earth, water and the movement of natural forces. With bold color sensations and energetic handling of the paint surfaces, one is transported through realms beyond the ordinary world into new visual experiences of wonder and beauty." IDB calls for Latin American and Caribbean artists to submit proposals for exhibition on the region's migration experience. The IDB˙s Multilateral Investment Fund (MIF) and Cultural Center invite artists from throughout the region to submit artwork that tells the story of migration˙s impact on individuals, communities and nations for its exhibit Far from Home: The Migration Experience in Latin America and the Caribbeanˇ to be held in Washington D.C. June 9-20, 2008. The exhibit is open to all artists born in Latin America and the Caribbean, regardless of where they live. The deadline for submission of art portfolios is April 18, 2008. This exhibition on the migration experience of the region in the 21st century seeks to share the dreams and tears of the migrant experience in Latin America and the Caribbean, added Felix Ãngel, director of the IDB Cultural Center. Artists interested in participating in this exhibit see guidelines here. Tickets $10 / Members: Free. Bethesda's Osuna Art through April 5, 2008. The IDB’s Multilateral Investment Fund (MIF) and Cultural Center invite artists from throughout the region to submit artwork that tells the story of migration’s impact on individuals, communities and nations for its exhibit “Far from Home: The Migration Experience in Latin America and the Caribbean,” to be held in Washington D.C. June 9–20, 2008.